Do you ever see something in a store or at the mall that provides inspiration for your own interpretation of an item or set of items? Over the holidays, my daughters and I spent a couple of mornings at our local mall, where I was struck with the appeal of some filled jars on a ledge of a kiosk. I won't give away what was in those jars just yet. Anyway, I thought "gee, I need to get me some of them neato jars." My two daughters were with me that morning and agreed that my idea would be awesome. Once home I found that I had 6 of these square Lemon Curd jars, which looked to be perfect for my little project. The obstacle (as always with repurposed jars) is the labels, front and back and very well-adhered to the glass. 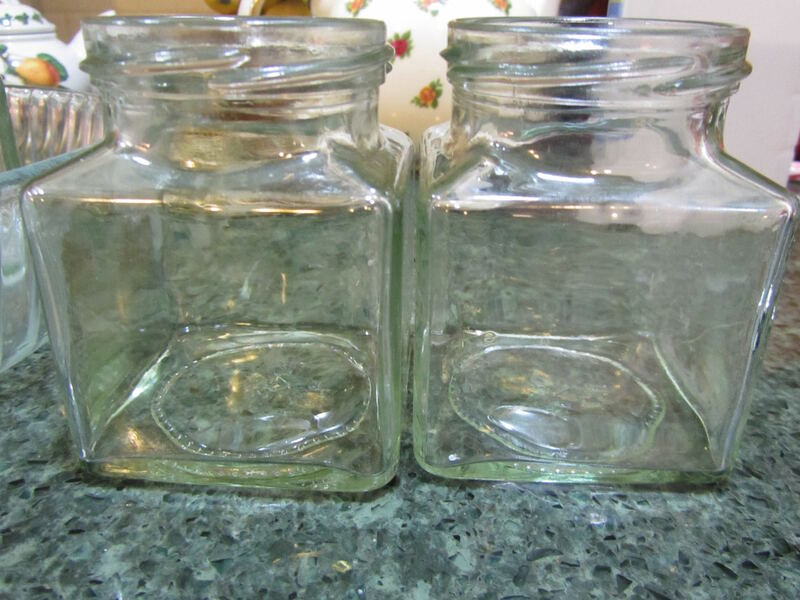 However, these jars are square, which means the labeled sides would rest flatly in a shallow dish of rubbing alcohol. Just before heading out to run errands I placed 4 of the jars in a glass dish with a small amount of isopropyl alcohol. When I came home I used a metal scraper to remove the bulk of the label on the underside, and then flipped the jars over. After removing the paper part of the labels I continued to soak the jars for a little longer, until I could use a cloth to rub off any sticky residue. I ran the jars through the dishwasher and I now have 6 wonderful square jars for filling. Come back on Monday to see what these are now filled with. The rubbing alcohol is reusable. 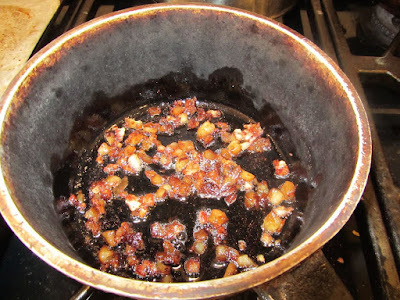 I put what was still in the dish into a glass jar to use another time. Hmmm, very intriguing Lili. Can't wait to see how you use these jars. Those jars are adorable! Can’t wait to see what is in them. Thanks for the tip...I have struggled with trying to get labels off....and wouldn't have thought to reuse the alcohol. Now to see how you fill yours��! Those jars are beautiful... can't wait to see what you do! Love those jars! Just wondering....I've never bought lemon curd. Where did you purchase it and what do you use it for? The lemon curd came from Trader Joe's. The luncheons/teas that I volunteer for on a monthly basis serve lemon curd with scones. I scavenge the empty jars out of the recycle bin each month. 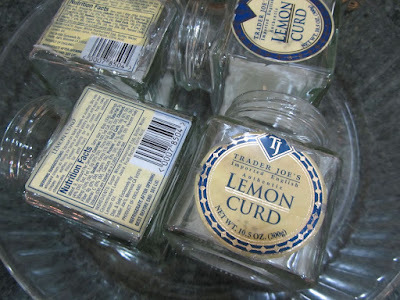 I don't know how expensive the TJ lemon curd is, but you can make it from scratch for very little. On the jars, Trader Joes has quite a few nicely packaged items, like jams and spreads. 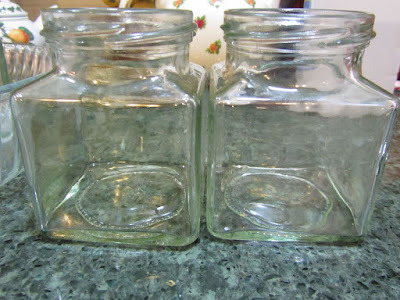 I've also snagged a couple of larger squarish jars from the recycle bin that have had some sort of spread in them. I hate to see nice glass jars just get crushed to be remade into other jars. I'd rather reuse the original jars. I have a fondness for jars and have to force myself to limit how many I will save to re-purpose. They are great for storing nuts, seeds, bulk popcorn kernels, etc. Can't wait to see what you filled those nice square jars with! I gave a little glass jar to my daughter a few months ago. She covered it with washi tape and uses it to hold odds and ends. There are so many things you can do with them! I remember you mentioning that, Kris. Now I need to find out what washi tape is! My husband is not too happy with me these days because I love all kinds of jars! I use them to store everything and he just doesn't understand why I need them all! At Christmas we had a couple of potlucks and I brought salad with home made dressing. I used a very pretty jar (the kind that Aldi sells their flavored peaches in) for my dressing and it was beautiful! I put sugar cubes in tall jelly jars from Aldi, leftover pasta when I use 1/2 a box, spices, flour and so much more. Yes, labels are the most difficult thing to remove but no necessary to have a beautiful jar! Alice, I have a cupboard filled to bursting with glass jars. I save all of them, too. I've found that they make great containers for gifts, as well, even gifts that wouldn't normally be stored in a jar, using some shredded, colorful paper to cushion an item. Glad to hear I'm not the only one saving our jars and buying used jars at thrift stores. Especially if I have lots of the same style, I keep it automatically, pill containers, boxes, produce plastic bins. I love turning trash into art. Got my granddaughter hooked making junk journals, so I save for the both of us. 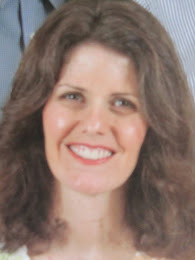 Have a great day, can't wait for the reveal tomorrow!! My project turned out fun! I'll show you in the morning. It's nothing super monumental, just a fun thing for my family this winter.